Look out Conan O'Brien, Ellen DeGeneres is jumping aboard the "clueless gamer" train, and she's doing it with the help of one of the most popular games in the world: Fortnite. 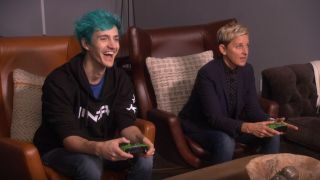 This week, the popular talk show host invited Fortnite streamer Tyler ‘Ninja’ Blevins onto her set so he could give her a quick lesson in the art of battle royale. If you're curious what brought this on in the first place, the answer is "dancing". Ellen is known for making dancing a big part of her show - she does it, her guests do it, the audience does it, even her staff does it. When Ellen Show DJ Stephen "tWitch" Boss showed off Fortnite's "Orange Justice" dance, it inspired her to learn more. She reached out to Ninja, who partnered up for her first jump off the Battle Bus. I don't think she'll make another. While Ellen may not need our Fortnite Battle Pass Challenges guide, you might want to take a look - especially if you need to do the Fortnite Tier 100 Challenges so you can run around the battlefield as a tough guy werewolf.